Lets have a look at how the surface selection by "Seed and Boundary" works and possible benefits. The real benefits of this method will come when the model goes through unexpected changes and by following this approach, your model will be really rigid! What are the general methods of selecting surfaces? The main classification of surface selection is..
Before going into the main topic, we just have a look at other options. Individual surfaces : Select all necessary surfaces one-by-one. Bounded Set -> Neighbouring surfaces : ProE selects all neighbouring surfaces of the anchor surface. 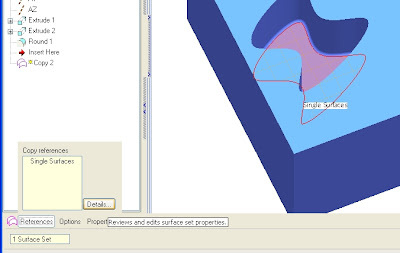 Exclude Surfaces : Individually select surfaces that has to be removed from the selected ones. What is seed-boundary surface set? 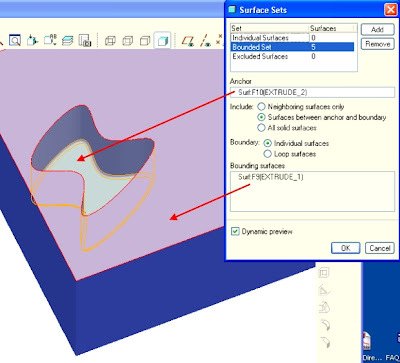 In this option the user selects one surface as anchor (the seed) and one (or more) surface(s) as boundary surface(s). ProE then takes all surfaces starting from anchor (seed) and bounded by the boundary surfaces. Assume you want to make a copy of a surface set by this option. Select the surface which will be the seed. 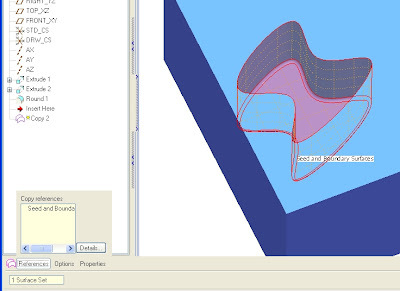 In part level, if the selection filter is "SMART" then first click will select the feature and next click will select the geometry (surface, edge..). Or else you can change the filter to "GEOMETRY" and then select the surface easily. At this stage it will look something like this. Click "Details" and Click "Add". Now select the anchor and boundaries. Then it should be looking like this. Click OK and your surface is ready. In case you see one more entry here (single surface), right click and remove. I prefer this one, as this is easy! release the SHIFT key and the ProE will display the the surface set. Now you can rotate the model. Again you click SHIFT and continue the boundary selection. Releasing the SHIFT will update the surface selection. You can do the Ctrl+C Ctrl+V to create a copy of this surface set. Steps 1 to 4 can be followed in other surface selection situations. Like, you wanna apply the colour to all the surfaces in a pocket. 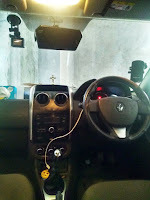 Its easy with this as you don't have to go and select all surfaces one-by-one. But the real power of this some things else. When you make a pattern of a group of features, this comes really handy. In fact this is better than the feature pattern in terms of performance also. Consider the model that I showed above and I wanna pattern the pocket. 1. make a group of the Cut-Extrude and the Round. Pattern it. 2. Make a pattern of the Cut-Extrude. Make a Ref pattern of the Round. Here I will make a surface copy (selected with seed-boundary option) and make a pattern of it. Then make a soldification of the surface and make a reference pattern. Now I want to change the pocket. I not only want to change the dimensions, I want to add some features in the pocket. You just have to go to the inset mode above the copy feature, add your features and remove the insert mode. See what happened! The new features are updated in all pattern elements. This option is so very useful in ProE when you have to deal with complex geometries and features. This is more important because if you do a GROUP and pattern, its almost impossible in ProE to add or remove some features from that. By this option these hassles are more or less avoided. Have a look at the model tree. I just added the three features in between and the pattern gets updated automatically and easily!! 1. Be careful with your selection. Take the references in such a way that there is least possibility of failing with its design intend. 2. Understand the how this works and select the boundary surfaces accordingly. For eg, if there is a chance that the pocket may get opened to the side when you modify it, then include the side surface also in the boundary surfaces, so that the feature will not fail when you make such modification. I have used it somewhere earlier, but now i understand it properly.